Check out the article below for more information about the luxury apartments at National Harbor. National Harbor’s first rental community, Esplanade at National Harbor, offers resort-style living at the 350-acre mixed-use development on the banks of the Potomac River. National Harbor has a hotel and conference center, restaurants, shops and entertainment venues, as well as condos and townhouses to own. The Esplanade, which is 34 percent leased and 20 percent occupied, has a private residents’ clubhouse with a high-definition golf simulator (virtual golf system) with five championship courses; a swimming pool; a courtyard with a fire pit; an outdoor kitchen with grills; bocce and other lawn games; art installations; a fitness center with a yoga studio; a business center; and a conference room. Rents range from $1,675 to $3,100 for studio and one-, two- and three-bedroom units. The apartments include high ceilings, large windows, granite counters, Energy Star appliances, energy-efficient gas cooking, large-capacity washers and dryers and walk-in closets. Some units have a patio or terrace. Check out washington.org‘s 10 things to do this weekend to honor veterans and fallen heroes in the nation’s capital! 1. You can’t talk about Memorial Day in DC without mentioning the National Memorial Day Parade. Put on since 2005, the parade—the largest of its kind in the U.S.—is run by the American Veterans Center and honors those servicemen and servicewomen who put their lives on the line to protect our freedoms. Set on Constitution Avenue, the march wows audiences exceeding 250,000 strong with marching bands, active duty and retired military units, youth groups, floats and hundreds of veterans. This year’s parade is set for Monday, May 25, starting at 2 p.m.
2. Arlington National Cemetery hosts an array of events to mark Memorial Day. Head to the Memorial Amphitheater at 11 a.m. on Monday, May 25 for an official Memorial Day service, sponsored by the U.S. Army Military District of Washington. Meanwhile, more than a quarter million mini flags will decorate the cemetery’s headstones. For another powerful tribute, head to the Tomb of the Unknowns, which is guarded by Tomb Guard Sentinels 24 hours a day, 365 days out of the year. Stick around and you’ll see the impressive Changing of the Guard ceremony, which occurs every half-hour until the cemetery closes at 7 p.m.
At 4 p.m. The Women in Military Service for America Memorial, located at the gateway to Arlington National Cemetery, will hold a ceremony that includes formal military honors, a keynote address, wreath-layings and the Memorial’s signature event, the scattering of rose petals in tribute to departed comrades. Urban Turf provides the scoop on Mortgage Insurance for first-time buyers. Be sure to check out all the information in the article here. 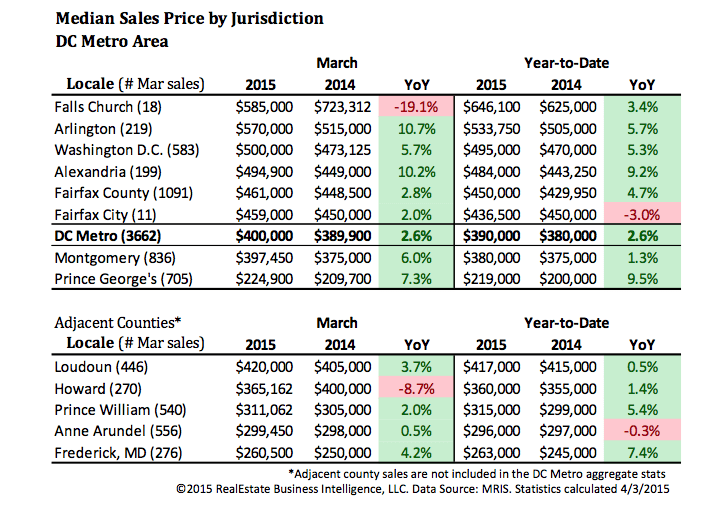 DC Curbed reports that buying is actually the cheaper option. Check out the article and Trulia’s interactive map below. Here is Trulia’s interactive map. The Washington Business Journal reports that closed sales have jumped almost 40% from February to March. Check out the report and the data below.